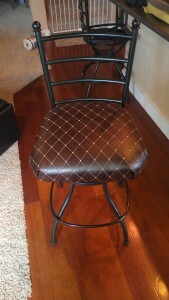 Recovering bar stools is a simple do it yourself project for even those who have never worked with fabric. Whether your bar stools are worn and stained like mine were or you have moved in a new home and are wanting to create a new look, this is a fun, easy project you can get done in only a few hours! 1. Pick your fabric! If this is your first time recovering a piece of furniture, I suggest unscrewing the seat from the frame of the bar stool and taking it with you to the fabric store. They will assist you with finding a type of fabric best for your project as well as ensuring enough is cut to appropriately cover your chair. If you are just measuring the dimension of your seat cushion, remember you will need a few extra inches on each side to adequately cover the cushions of the stool. Personally, I wanted something wipable so I went with a feaux leather. If you are also needing new foam, have one of the fabric specialists assist you with picking one right for your project. 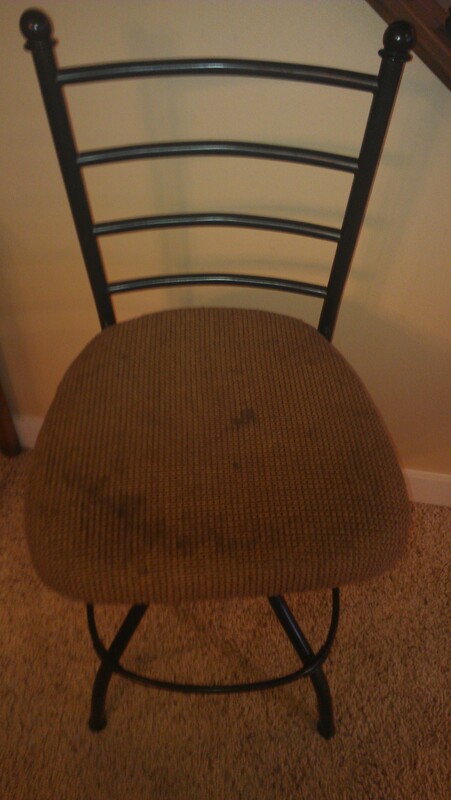 I chose to add an additional layer of foam to what already was in my bar stools. 2. 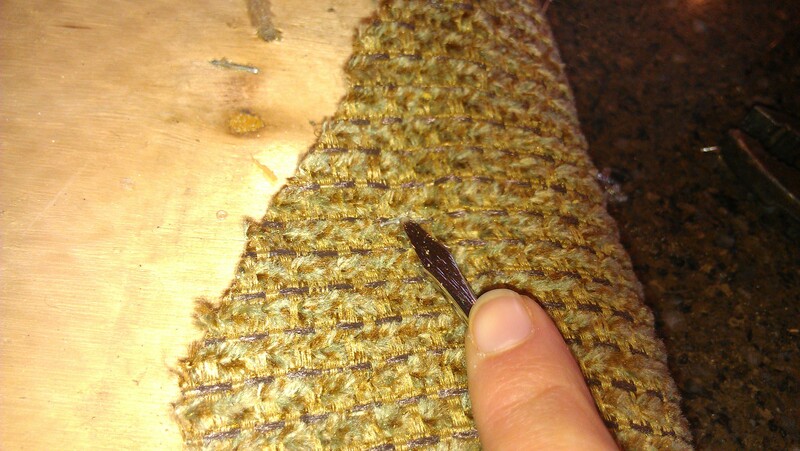 Remove the current fabric from your stools– I found it easiest to remove the staples using a flat head screw driver. Once I had the staple lifted, I used a pair of pliers to pull it out. 3. 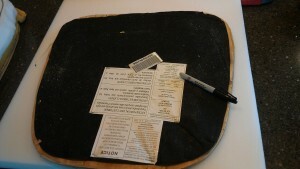 Trace and cut your foam– I set the frame of the seat on the foam and traced it with a sharpy. When you cut your foam, cut about 1/2 in wide from the sharpy line as you will lose a bit of foam when you are pulling the fabric tight to cover it. 6. Staple time!-This part of the project is helpful to have an extra helper but doable on your own. I found it easiest to do each of the sides first and save the corners for last. Pull up the edge of your fabric around the cushion to the bottom of the chair. Pull it tight and staple. Keep pulling your fabric tight and stapling every inch or so until you have all sides completed. The corners may take some playing around with until you find a look you like. I tucked the edges of my fabric in like a present so my corners just had two folders. The key is to be sure each of your corners are folded the same. 7. Add backing-If you desire, you can staple a backing over the bottom to cover all the fabric edges you just stapled. I figured no one would be looking under my bar stools so I did not do this step. 9. Yell out a woohoo because you are done! !